Since the early 2000’s the Solar Power industry has experienced a huge surge in growth due to the advancement of solar technology as well as subsidization in the way of rebates, tax credits and other incentives. There’s no denying the great potential of Solar Power and its ability to help companies with their energy conservation efforts if applied properly. However, there is one particular issue that is especially daunting for some PV buyers, and that is demand charges. Some critics ask “What about when the sun is not shining, such as rainstorms, periods of cloud cover or during nighttime hours?” Fortunately, this question can partially be answered with the use of Demand Control. But before we go further into this, let’s first recognize that PV economics depend on electric rates and those vary from utility to utility and from state to state. Although Solar Power is focused towards Energy Conservation versus Energy Efficiency like Demand Control, the two applications can work hand in hand. In some areas special PV rates are available that are kWh only, and range from zero to 1MW. If you have a rate like this, this article is not for you. If, on the other hand, you’re on a standard demand based electric rate, read on. For the economics of Solar to “work” and reach its full potential, you must take into consideration those periods without sun and form a game plan to combat the issue. This is where Demand Control can help. You can actually use Demand Control as a Back-Up Plan for those times when Solar literally can’t get the job done. 1. kWh Delivered – this is where there is positive energy flow from the utility to the customer. “Delivered” is from the perspective of the utility. 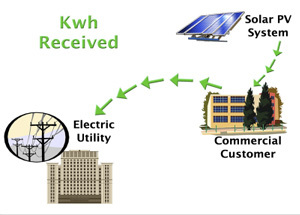 2. kWh Received – this is where there is negative energy flow and energy is flowing to the utility from the customer. Again “received” is from the perspective of the utility. 3. 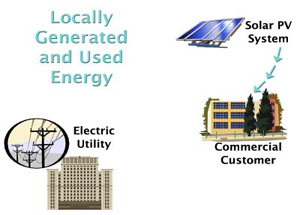 Locally Generated and Used Energy – this is energy that is generated by the customer’s PV system and is used for the customer’s loads. No power flows in either direction to or from the utility since the load is perfectly balanced with the supply. Although rare, this state can exist. This is why both a net meter and a production meter are generally required by the utility for solar applications. 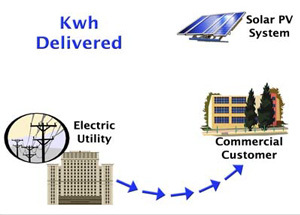 Problems for the customer related to peak demand charges occur with the kWh’s Delivered. This is because the peak demand for energy flowing from the utility to the customer is calculated by the electric meter as it normally is during those times when the PV system is not generating the building’s needs. There are two common situations where demand control can help support solar efforts. The first is keeping the peak demand below the kW rate threshold so as to insure that the customer can stay on a non-demand rate. Since there is no demand component on these “Small General Service” rates, each kWh of energy generated by the PV system is worth more, and as such provides a greater return for the owner, both in avoided purchased energy and energy sold to the utility. All utilities have demand rates for commercial customers above this threshold. As we’ve mentioned in past articles, such as our June 2011 articles on “What is Demand” and “Why Care about Demand”, being on the correct electric rate can make a big difference in your electric costs. Although they vary between utilities, demand rates have separate demand and energy charges. The Energy charge on this rate is much lower than on the SGS rate, but in addition, has a demand charge which can be up to about 50% of the bill. This next rate tier is usually called MGS for “Medium General Service.” Customers on this rate have demands above the threshold, and for those customers who are just slightly above the threshold, demand control can move them back into the SGS class. When using Solar Power, staying below the threshold during periods of sunshine is rather easy for most solar customers (depending on the system in place and the local utility.) However, during cloudy days and night time hours this becomes a different story. For example, if a facility was operating at peak use during a time frame of cloud cover they could easily go over their kW threshold moving them to a higher demand rate class, normally for at least 12 months (time depends on local utility policies.) It only takes one demand interval (generally 15 minutes) to set the peak demand for that month. So keeping the demand low during those times of cloud cover or night time hours, (and thus positive energy flow) is crucial for keeping costs down while maximizing the benefits that a Solar System provides. If any of these customers were moved to the next demand rate tier, (Xcel’s General Service “SG” rate), they would begin paying a demand charge which could easily offset savings that the solar system generates. Not only would they face this reduction in savings, but if they wanted to “sell” some of their solar produced kWhs to Xcel, they would be sold at a much lower price. On the C-Rate, Xcel buys kWh around 8¢ versus 3¢ on the SG rate. Most solar clients strive to pay as close to $0 on their electric bills as possible, and without a demand controller this becomes a difficult goal to achieve. The second type of Demand Control and Solar partnership is for those customers that have too high of a peak demand to get below the threshold, but lowering their peak demand will still allow them to pay less, sometimes substantially less, in demand charges. This type of Demand Control is used purely to keep electric costs to a minimum. We’ve had customers who have offset all or most of their kWh charges with their Solar Power generation, but are left with Demand Charges on their electric bill. 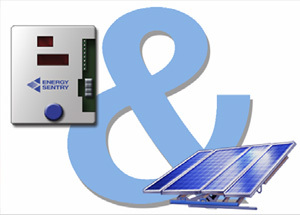 By installing an Energy Sentry they have minimized their demand costs, thus reducing their electric bill even further. Whether the focus is on energy conservation or demand management, when used together both solar power and demand control make a very powerful “Green Team.” Although we all would like to have less of a negative impact on our surroundings, it’s important for any organization to take into account whether or not it financially makes sense. By incorporating demand control to be used alongside solar power you save more money, making this an all-around beneficial situation for your company. If you are interested in learning more about Energy Sentry demand management systems and how they can be used with Solar Applications, contact the experts at Brayden Automation Corp. Previous Article:What's New with BAC?